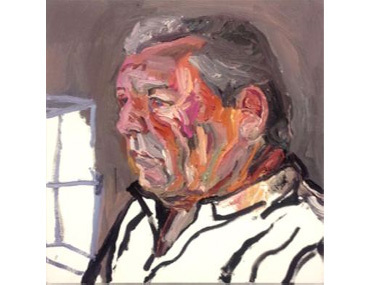 High profile artists, including four Archibald winners, have joined forces with the ABC and have donated artworks to be auctioned online to help raise funds to boost mental health research in Australia. The ABC Mental As... Art Auction is a lynch pin in the ABC’s fundraising effort culminating in a two-hour, live TV fundraising event. Friday Night Crack Up, which screens at 7.30pm this Friday, will see Australia’s biggest personalities - comedians, actors, sportspeople, and musicians – come together to show their support for Mental As... and encourage Australians to take action, start talking, and give to mental health research. The Aboriginal artists involved are Daniel Boyd and Richard Bell; also participating are Ben Quilty, Del Kathryn Barton, Euan Macleod, Fiona Lowry, Leah Fraser, Reg Mobassa, Robert Malherbe and Tim Sharp. Their pieces, each exploring themes of mental illness, will be available for sale via an online auction concluding on Sunday October 12. 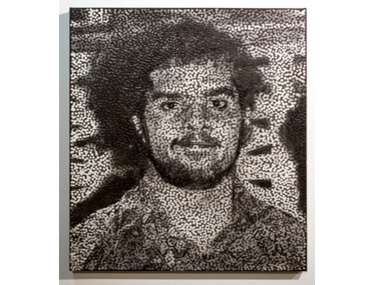 Daniel Boyd says of his artwork, Untitled, “It's a painting of my cousin, little Les when he was 21. He's actually quite big. He has schizophrenia, and has lived with it since his late teens. This painting is not just about little Les it's also about his family and the people who now care for him”. 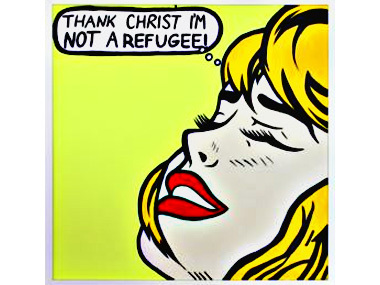 And Richard Bell's explanation of his apparently unrelated Lichtenstein-esque work; “The text 'Thank Christ I'm Not A Refugee' connects with my concerns to highlight post traumatic stress disorder (PTSD), a condition that many refugees suffer under current government policy. Mental Health Week also draws attention to the often hidden plight of everyday Australians suffering from mental health conditions and disorders”. The artworks are on display to the public in Sydney in the ABC’s Ultimo foyer until October 10.